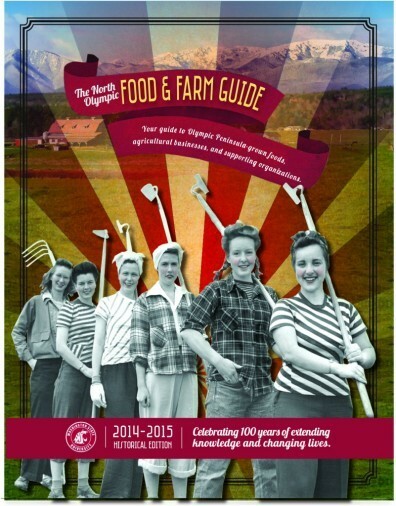 WSU Jefferson County Extension has created the 2014-2015 North Olympic Food & Farm Guide available for pick-up at local visitor centers, participating farms and businesses, and the our extension offices of Jefferson and Clallam Counties. This free guide boasts over 130 descriptive listings of family farms, local food restaurants, supporting businesses and organizations throughout Clallam and Jefferson counties, acting as a comprehensive resource for all things local food- and agriculture-related on the Olympic Peninsula. In celebration of Extension’s centennial anniversary, the guide follows a historical theme and is populated with chronological timeline events from 1914 onwards, as well as a number of informational articles regarding current Extension and community programs. Port Townsend: Port Townsend Visitor Center, PT Coop, and our office in the Cupola. Why a Local Food & Farm Guide? In accordance with its mission, WSU Extension aims to increase knowledge of local agricultural endeavors in benefit to producers, businesses, and the community at large. For many of the entities involved, a publication like the Food & Farm Guide creates the opportunity to reach a newer, wider audience. This is especially true for the small family farmers who often don’t have the time to work on outreach and publicity themselves. Moreover, the guide paints a picture of this region’s current food network and creates vision for those interested in becoming involved. We encourage beginning farmers and food- or ag-sector entrepreneurs to read the guide in its entirety for inspiration on creative business opportunities that may fill existing gaps. Ultimately, our goal is that you may take away something from the guide whether you are a consumer, farmer, visiting tourist, restaurant owner, entrepreneur, or simply curious. The publication originated as the Farm & Garden Resource Directory, a 13-year Sequim Gazette publication jointly produced through volunteer effort by WSU Clallam County Extension and Friends of the Fields, now a division of North Olympic Land Trust. Last distributed in 2011, the popular project was revived in 2014 as part of Clallam County Extension’s AmeriCorps*VISTA project assignments. It then became a collaborative effort between WSU Clallam and Jefferson County Extension, expanding the guide to include Jefferson County listings.